Today we launched a major interactive campaign for the KFC / Guitar Hero World Tour promo. 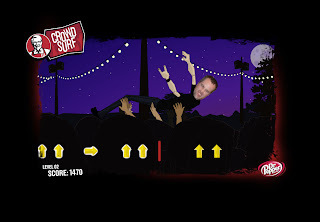 The campaign included banners for IGN.com, mainstage design on kfc.com, a microsite (kfcrocks.com) and a videogame (surfthecrowds.com). And this isn't a freebie, level 03 is hard! I bet 99 percent of players do not get it on the first 3 attempts. I applaud our agency client for believing in this vision and helping KFC believe in it and the entire team in bringing it to life. I hope people find it as fun as it was to make.